A thrilling trailblazing adventure that builds real-life skills. As the leader of a wagon party, you’ll choose your team and supplies, read maps, plan your route, and guide your team through the unknown wilderness. Tough choices lie ahead, but with the help of your wagon party and people you meet along the way, you’ll complete this challenging journey and arrive in a new land. Select a team with skills you think are important, stock up on supplies, and hit the trail. Learn History Firsthand - Read authentic journals, maps, and newspapers from the 1840s. Talk to the people you meet along the way - their advice may help you make decisions. Replenish your food supply by hunting and fishing. Survive the dangers of the long journey - buffalo stampedes, sickness, and gunshot wounds. Watch history come alive with 3D travel, 360° panoramic views, and full-motion video. 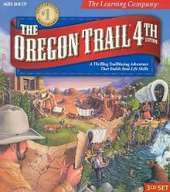 Use guidebooks, maps, advice from fellow travelers, and instinct to determine the best route to Oregon. Will you cross the raging river or continue along the trail?